Because of the hard rules for rookie cards in NHL-licensed hockey products, there isn't a lot of room for prospecting prior to a player's big league arrival. But that doesn't mean there aren't any. 2013-14 In the Game Heroes and Prospects Hockey offers one such avenue. The base set highlights up-and-coming players collectors can expect to go in the 2014 NHL Draft and even further into the future. And as the name suggests, they're complimented by some greats from the past. Returning for a second year are 3-D short prints. These highlight the top players expected to go in the 2014 draft. They're inserted two per box. 2013-14 In the Game Heroes and Prospects Hockey boxes come with at least four hits, two autographs and two memorabilia cards. Both are inserted 1:7 packs so there's a solid chance of land a fifth hit, although it's not guaranteed. Basic inserts combine to fall three per box. ITG's He Shoots, He Scores program returns. Collectors find points in packs and can be saved and redeemed for exclusive cards. Click here to see the full 2013-14 In the Game Heroes and Prospects checklist. 2013-14 In the Game Heroes & Prospects Sam Bennett autograph near mint ! Good: Hockey prospecting at its best, 3-D cards return, improved “Heroes” artwork. Bad: Tons of doubles, basic inserts easily overlooked, puzzle decoys could use identifiers. The Bottom Line: The hobby can learn a lot from Heroes and Prospects. It’s a brand that has an identity. It does so without a lot of flash and bang. A few other brands have managed to carve out a similar identity, but not many. This is a set for hockey prospectors who like going after sets. At the same time, there are ample hits if that’s your thing (or you’re a set builder who wants a little bonus to go with the chase). Returning for a second year, the 3-D cards are fantastic. And while the odds leave room for extra autographs and memorabilia cards above the promised pair of each, my box managed to yield six instead of the expected four. This appears to be a somewhat common thing. 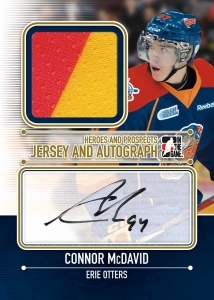 The 2013-14 ITG Heroes and Prospects base set sticks with a very similar design from last year. Cards have a full-bleed look save for a stripe that runs up the side. The prospects photos are strong. The artwork used to depict the “heroes” portion of the set is much improved over last year. Overall, it’s more realistic and does a better job of capturing the player. Some of reference shots seem odd as they have the player behind one of the fence-like face guards, thus obscuring their features. The result on these select few “heroes” is something much more generic than those that are able to focus solely on the face. The stripe running up the side of the card is a little much. The have a lot of text squished into them. Combine that with the positioning and they can sometimes overpower the image. My favorite cards are the 3-D “Class of 2014” cards. The technology might be a gimmick, but it is very well done. As far as autographs and memorabilia cards go, little has changed. And that’s not a bad thing. Although signatures are on stickers, they’re hardly noticeable. ITG continues to deliver some of the biggest jersey swatches in the hobby, which even makes the plainest pieces seem noteworthy. The biggest disappointment are the Tenth Anniversary inserts. I initially missed them while I was opening the packs only to spot them while I was putting things in order afterwards. Because they don’t use any different technologies, they look and feel more like a subset. I’ll continue to nitpick on the puzzle decoy cards a little as well. Because they show small pieces of a player, it’s sometimes tough to figure out which puzzle a card is for. A simple number or identifier would make this much more helpful. Much like Bowman Baseball, it’ll take a couple of years before you know what sort of NHL impact a lot of these players will make. With such cut-and-dry rules about rookies in NHL sets (which isn’t a bad thing), Heroes and Prospects fills a void by offering attractive prospect cards in the meantime. The checklist is big enough, both in the base set and the hits, that you get key players without an excessive amount of filler. Any product that significantly over delivers in the high-end departments is good value. Even when those players aren’t spectacular, they’re a nice bonus. Being a set collector, I was disappointed the box I busted had way too many doubles. I had nearly as many extras as I did singles. If this is an isolated incident, that’s not so bad. But if it’s widespread, it is a major issue. Trading and tracking down singles is fine, but when it’ a product for set builders and you’re left with so many doubles in one box, that’s not a good thing. Long gone are the days of $0.50 packs where this sort of thing my get more of a pass. Heroes and Prospects is one of my favorite sets ITG does each year. It’s focused, it consistently delivers decent cards and it’s fun to build. There’s also some long-term appeal as it’s handy reference material to track player progress either as they approach being drafted or they make their way to the NHL. i would give this product a rating of 5.the overall quality of the photography was great,a nice selection of prospects&established stars.the inclusion of the hits was excellent&the auto’s were nice although i would have liked to have seen at least 1 established star auto included. Seems like all the box breaks I’ve seen from this have been decent. Am I more likely to score a McDavid card here or in a 2014 ITG draft prospects box? Both boxes cost about the same. Wondering which has more value. I bought a box on a german store (I’m French) and I receive the item this day. Very good box !!! Three memorabilia cards (Pouliot topprospect game-use jersey – Horvay game-use jersey – Saad 10th anniversary prospect jersey), three autos and three 3-D class of 2014 !!! Three more hits that previously indicated ! !